Is there a luxury watch as famous as the Rolex Submariner? We think not. In fact, so renowned is this watch that not only has it become the archetype of what a modern dive watch should look like but it’s also notoriously known as the most counterfeited watch in the world. The Submariner has long graduated from its once tool watch position to become a symbol of status and success. So it’s no wonder that there are plenty of celebrities wearing Rolex out there that have at least one in their luxury watch collections. 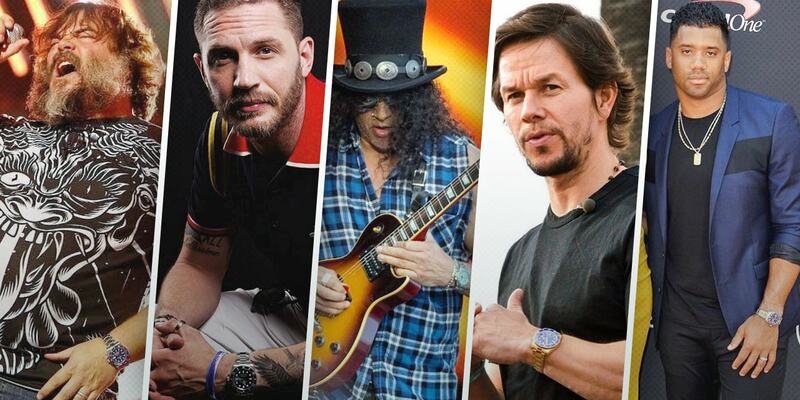 Here are some of our favorite sightings of celebrities who wear the Rolex Submariner watch. Actor, comedian, musician, and songwriter Jack Black has been entertaining audiences for decades. A hard-working celebrity, Jack Black has currently been doing the rounds on talk shows promoting his latest movie, The House With a Clock in Its Walls, as well as his tour with his comedy rock duo, Tenacious D.
During his interviews, we could not help but notice a very special Submariner on Jack Black’s wrist—an 18k white gold Submariner ref. 116619 with a blue Cerachrom ceramic bezel and a matching blue dial. Sometimes known as the “Rolex Smurf,” the watch may have a funny nickname, but make no mistake; this is a seriously luxurious sports watch. Quarterback of the Seattle Seahawks, Russell Wilson is aiming to replicate his team’s 2013 Super Bowl victory. Along with his demanding football career, Russell Wilson and his wife Ciara announced they were joining an effort to bring an MLB franchise to Portland—this is on top of his numerous business ventures and paid endorsements. So how does the busy NFL quarterback keep track of all his time? Sometimes with a handsome two-tone Rolex Submariner ref. 116613LB on his wrist. In addition to the appealing mix of yellow gold and stainless steel, Russell Wilson’s Submariner also has a vibrant blue Cerachrom ceramic bezel and matching blue dial. Style-wise, that’s a touchdown for us. A familiar face starring in blockbuster movies like Inception, Mad Max: Fury Road, and The Dark Knight Rises, actor Tom Hardy is killing it as an action star. This year is an especially big one for the London native as his movie, Venom, is currently raking in millions at the box office. Off-screen, Tom Hardy is known for his stylish ways, often appearing in men’s magazines like GQ, Esquire, and the like. And if you look closely at his arm, you’ll most likely spot a Rolex watch there as he has quite a few in his collection. His Sub of choice is the classic stainless steel Submariner ref. 116610LN with the black ceramic bezel and black dial combo. You simply can’t go wrong with a stainless steel and black Submariner. Mark Wahlberg is no stranger to our celebrity Rolex articles since he has one of the largest collection of Rolex watches we’ve ever seen one famous person have. Plus, he continues to add to it regularly with new Daytona, GMT-Master II, and Day-Date models. As for Submariner watches, we’ve seen Mark Wahlberg wearing at least two different ones—both in yellow gold. He has the yellow gold 116618LN with the black ceramic bezel and black dial configuration, as well as the yellow gold 116613LB model with the blue bezel and dial combo. Why settle for one when you can have both? In the late 1980s and early 1990s, there was no bigger rock band than Guns N’ Roses with singer Axl Rose and guitarist Slash at the helm. But as is often the case in rock and roll, Axl Rose and Slash’s relationship was tumultuous, to say the least. Slash finally left the band in the late 1990s. Against all odds, Guns N’ Roses have reunited and are in the midst of their hugely successful global Not In This Lifetime… Tour. And Slash has brought his favorite stainless steel Rolex Submariner ref. 116610LV “Hulk”—a watch he has been wearing for a while now—along for the ride as he plays to tens of thousands of adoring fans. The “Hulk” is beastly watch that can definitely keep up with high energy Guns N’ Roses concerts. Whether in steel or precious metals, in blue, black, or green, the Rolex Submariner is as recognizable as the celebrities that wear them. Stay tuned for our next article where we’ll highlight celebrities who wear the Rolex Daytona chronograph.